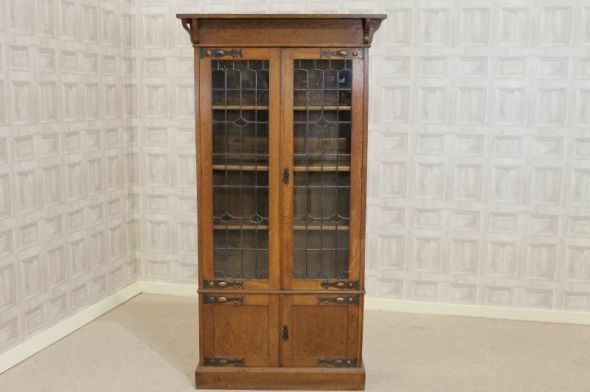 A beautiful solid English oak circa 1900 arts and crafts glazed bookcase. This solid oak bookcase features a stylish flat top cornice which leads down to two large leaded glazed doors, intricate coloured glass, and a small cupboard below. The hinges are decorated with copper plate strapping; typical of the arts and crafts style. The bookcase comes with the original key, and features internal adjustable shelves which are also made of solid oak. The item is in lovely condition for its age, but unfortunately, there is a small piece of damage to the glass on the left hand door. This is barely noticeable, and is clearly shown in the photographs provided. A lovely addition to any arts and crafts interior as a useful piece of office furniture.